Psst—do you want to know a secret? There are a lot of hidden surprises scattered throughout Disney’s vast complex of theme parks outside Orlando, Fla. Do you want to know another secret? You will never find them all. Disney Data at Hand: Both of the TimeStream Software Notescast apps reviewed here organize their information by chapter, so information about Disney’s Florida theme parks are only a few taps away. There are many books on the market to assist you in planning your Disney vacation. 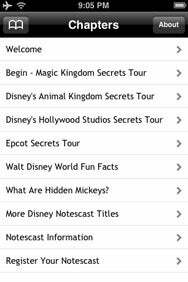 Two iPhone apps by TimeStream Software—Walt Disney World Guide Notescast and Walt Disney World Secrets Notescast—work as interesting and portable supplements to those typically heavy tomes. Both of these $1 apps are text-based guides to the Orlando theme parks. They each allow you to select a topic and then scroll through pages of related information served to you in bite-sized nuggets related to a certain theme or a specific park. The Walt Disney World Notescast is organized into 19 different topics such as Annual Events, Find Characters, and Phone Numbers. Tap your selection and dive in. Some sections are lush with useful advice and information. One specific section—Hidden Mickey Tours—provided lots of tips on finding secrets woven into the park’s tapestry. During a recent family trip to the Mouse House, my daughters and I definitely enjoyed following the Notescast’s tips to find some Mickeys—having this information at hand on an iPhone made it easier to do so. However, lots of the other information just didn’t serve much use in terms of being on our iPhone. For example, the section Guests with Disabilities did provide useful information. But it was all information we would have needed to know and review prior to arriving at Disney. It did not add any value or repeated usefulness while we explored the properties. The Secrets Notescast is chock full of advice on where, when, and how to experience the many hidden treasures scattered across the parks. Like TimeStream’s other Florida-targeted app, this one is also organized into text “chapters,” with one chapter for each of the main properties (Magic Kingdom, Animal Kingdon, Epcot, and Hollywood Studios) and then some park-agnostic secrets such as the chapter on Hidden Mickeys. Some of the nuggets are truly secret-I now know how Disney’s imagineers make the Eiffel Tower seem so large at the France pavilion in Epcot Center’s World Showcase—while others are really just advice to get the most out of your visit, such as how to shoot some great pictures while on the Animal Kingdom’s Kilimanjaro Safari. Unlike the first notecast, this Secrets notecast does add value by being on your iPhone while in the park. No matter where your location in the vast Disney realm you can discover a nearby surprise with just a couple touches. This proved very useful in passing the time whenever we were waiting in line for our next magical ride. In referring to both Notescast guides on my recent trip, I found little overlap, with Walt Disney World providing an almanac of park resources while the Secrets Notescast focused on, well, secrets. That said, you could probably get along with just one of the guides—TimeStream makes two others for Animal Kingdom and Disneyland in California—if its focus serves your particular needs. A visit to Disney’s Orlando parks can be overwhelming to all but the seasoned visitor. But whether the trip is your first or 14th, these guides can help you prepare for the trip and then maximize your trip as you enjoy learning about some of Walt Disney World’s secrets. Both Notescast apps are compatible with any iPhone or iPod touch running the iPhone 2.1 software update.